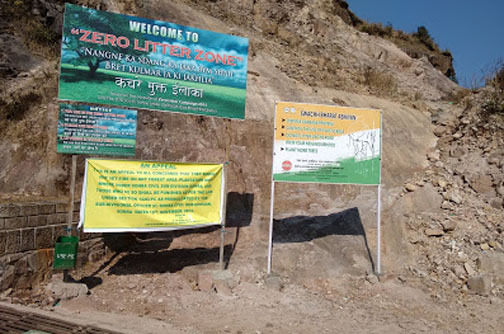 The Shillong Municipal Board (SMB) is undertaking a programme to intensify the monitoring of compliance with the Solid Waste Management Rules, 2016 by launching a pilot operation called ‘Operation Zero Litter’ to bring about a litter free Khyndai Lad area. Chief executive officer of the Shillong Municipal Board said that the operation will commence from February 15.
besides monitoring the streets to identify and penalise violators. From February 15 onwards, Khyndai Lad area will be notified as a ‘Zero Litter Zone’ and anyone found littering or disposing waste on open spaces, roads, roadsides or drains shall be booked and penalised under the SWM Rules, 2016 and the Environmental Protection Act, 1986. It may be mentioned that the Meghalaya urban affairs department had launched awareness campaigns in various localities of the city, schools and colleges for adopting ‘zero-littering lifestyle’ in 2017. Then Meghalaya urban affairs minister Ronnie V Lyngdoh told the state Assembly in March, 2017 that the taxi drivers had also been mobilised for the purpose. Lyngdoh had said awareness campaigns were being organized by the urban affairs department on the segregation and proper disposal of solid waste in and around the state capital. Replying to a call-attention motion moved by opposition member Jemino Mawthoh, Lyngdoh said the present dumping site on the outskirts of the city reached a point of saturation and that the government was implementing Solid Waste Management Rules, 2016, in the state.